Your montana mountain experience awaits in this home. 360 views of downtown and the ski hill. WiFi, hot tub, dog friendly and such an inviting space. It's vacation time! Spruce lodge is a rustic yet fully equipped log lodge that overlooks the city of Red Lodge from its enormous east deck. This upper level deck is located off the great room and has two large tables with outdoor BBQ. There are unobstructed Red Lodge Ski Mountain and Beartooth Mountain views to the west. It would be difficult to match the setting of this home and in fact it is the only home in the village of Red Lodge perched on the western bench. The property offers privacy and seclusion on its 13 in-town acres, yet it is mere blocks to downtown Red Lodge. The lodge was professionally decorated by 'Whispering Pines' Boutique of Red Lodge. Most of the furniture and accessories were ordered specifically for this home and the photo gallery speaks to the result. There are living rooms on two levels of this three story lodge, the space is ideal for an extended family or several families combined. This home is welcoming and can deliver an authentic Montana lodging experience. The home is arranged as follows: The upper level loft has two queen beds with an additional twin. This level has a full bath. The main level contains the fully equipped kitchen with breakfast bar, open great room, dining area, master suite, laundry room, half bath and ski room/reading nook entry. The master suite with a king bed is on this main floor and its bath has a walk-in tiled shower. Additionally there is large closet / dressing room en suite. There is WiFi throughout the house. The lower level has a living room with a Smart TV plus three bedrooms and a bath. Two of the bedrooms have a bunk with a queen sized bed and a twin. The third bedroom has two twins. All of these bedrooms have enormous closets. Access to the covered 6 person hot tub, patio and seasonal outdoor shower is from this lower level. There is ample parking for six vehicles. There is parking on the road outside the main gate for additional parking but we don't solicit or sanction large gatherings....indoors or out. Two dozen people would be reasonable capacity for a party or celebration. We ask that you respect this request as this is a family lodge. We don't intend to be the destination party venue for enormous groups. 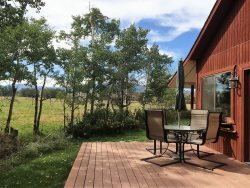 The property fronts the ~3 mile long Red Lodge hiking and biking trail which leads to an enclosed dog park. We are pet friendly. It is an easy stroll on this same path to the Rodeo of Champions fairgrounds to the west. The south lawn has a horseshoe pit with pins permanently installed. Horseshoes are provided. Spruce Lodge hopes to host you soon for your family vacation. Your Montana Mountain experience awaits!! Fantastic and quick service. Piney was incredibly helpful and went above and beyond to help. We are so thankful to find Spruce Lodge for our first trip to Red Lodge! It has everything we needed! The entryway/mud room was huge and housed everything for the 8 of us, especially with all the ski gear! We had 34 pairs of shoes! The house was amply stocked with all the supplies we needed! Even fresh drinking water that was easily refilled at the grocery store! You cannot beat the view, both atop the hill overlooking Red Lodge, but also the majestic mountain range! Hot tub was enjoyed by all, and even had a bun stocked with towels. We loved the size of the kitchen and center island. We were ALL able to be in there cooking or eating at once. We have never stayed in a place with our two families that could accommodate that. We will be back! We cooked all our own meals at the house. We had a large group and it was great to have a good grill and nicely equipped kitchen. The patio is an extension of the kitchen and living room. Your team was very accomodating and if you were away from office you were prompt in returning calls. We found beds comfortable with plenty of linens and towels. Kitchen was fully supplied and easy to work. Deck was overlooking Red Lodge. BBQ had full gas tank and ready to go. Another table on deck would have been helpful. There was two but one could not be used. Lots of hot water and we appreciated 3 1/2 baths. Members of the team were polite, courteous, and very helpful! Our family had a wonderful time and Spruce-Lodge was so comfortable and convenient. Decided we wanted to make it an annual event and Spruce-Lodge is the perfect place! Very pleasant, all in all a very good experience. All members were helpful and friendly. Excellent customer service! Was so lovely and comfortable I was sad when it was time to leave. Wish we could have stopped time. This was the best weeks vacation we had ever had. "Perfect location We were in town for a family wedding and didn't want to stay at a hotel to experience Red Lodge. Spruce Lodge was a perfect spot as it's just on the edge of town, but on top of a hill, so you can overlook the town and it's still close enough where the grocery store is only a 2 minute drive! The rooms were large and the house was spacious with lots of seating. Kitchen was stocked with everything we needed. We never used the hot tub, but I can see I can see where that would be nice when it got colder! Deck was large and a nice place to sit to enjoy the scenery. We had a couple deer show up one day, so the kids got a kick out of them. The only downfall is there is no air conditioning! It was fairly warm during the days while we were there, and the fans just weren't cutting it! But that's how all most hotels/houses are out there. " "View is amazing, so is the House! Overlooking the town of Red Lodge this place is amazing! Spruce Lodge can hold so many and than some! We have already decided a ski trip with family is in our future! We used the place as the center for activities for our daughters wedding. Our daughter and her 6 bridesmaids got their makeup and hair done in the living room with the fantastic sunlight and view thru the floor to ceiling windows so perfect! We even saw a mother bear and cub on their romp past the deck during the beauty time and it couldn't have been more perfect! Anyone who stopped to visit was impressed with the view and the size of the house. Definitely a favorite, it has everything...amazing view, room for everyone, beauty inside and out, not right in town but so close didn't feel too far away but still your own space to enjoy! Love the whole place we will be back! " "awesome getaway home! Left on Dec 1, 2014 for a stay in Nov 2014 This home was very accommodating for a large group, it was furnished with everything from cookware to linens etc. Nice outdoor hot tub overlooking the city. Pet friendly home as well. I would definitely recommend this rental! "